If the first Disney renaissance era took place in the 1990s, then we must surely be in a second coming over the last seven or eight years. Despite what the positive connotations of the term "renaissance" might suggest, though, it's been a curiously uneven affair. Let's say it began with Bolt. Bolt is a terrific film, packed with energy and humour and lovable characters. Two years later, Disney dropped Tangled - a joyously wonderful story with killer songs and breathtaking animation bound to deeply felt characters. Two years after this, we had Wreck-It Ralph. It's not that this was a bad film, it just failed to capitalise on the potential it offered. It certainly has its moments, but it's no Tangled. Then, in 2013, Disney gave us Frozen. The highest grossing animated film of all time, Frozen only really works if you're a girl under ten years old or are so desperate for feminist cinema that you'll leap at any opportunity, no matter how sketchy that representation is. Frozen is enjoyable, but its themes don't work. Last year we had Big Hero 6 - once again, brilliant - and then Disney came out and dropped arguably their strongest film to date with Zootropolis: a politically-motivated, thematically powerful anthropomorphic adventure with as much heart and humour as you'd want from a film of its sort. Now we have Moana. The big question - where does Moana rank in this second coming of Disney classics? The answer is "pretty damn high". 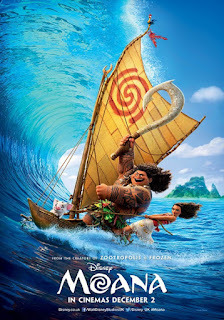 Moana herself (voiced by newcomer Auli'i Cravalho) is drawn to the ocean from a young age, feeling a deep spiritual connection to it despite her father - the Chief of their tribe on Motunui - disallowing anyone to venture beyond the reef surrounding the island. From her dying Grandmother, Moana learns that her people were once voyagers but lost their passion when a demigod named Maui (Dwayne Johnson) stole the gemstone heart of an ancient God, which was then lost in the ensuing battle, eventually falling into Moana's grandmother's possession. Moana takes the gemstone and sets sail for Maui in an attempt to bring the ocean's islands to peace and restore the adventurous nature of her tribe. On paper, it sounds like the familiar "break away from tradition" storytelling, but Moana is almost immediately very smart in the ways it finds its own footing by subtly breaking away from that formula. This is still a Disney animation through and through - the musical interludes and "Disney Princess" character type confirm this almost every minute - but it has a depth and thoughtfulness that Disney hasn't really looked at in a very long time. It doesn't touch on the political aspects similar to Zootropolis, rather it takes on the themes of tradition and self discovery you might expect from the Disney Princess character, and it turns them into something legitimately powerful. In other words, it does exactly what Frozen so desperately wants to do. There's no doubt that Moana will be discussed in a similar feminist vein to Frozen, but the difference is that Frozen treats its protagonist as an empowered woman while Moana treats its protagonist like a human being. Moana as a character immediately breaks convention in that she is actually good at her role on the island and seems to enjoy her time there. She isn't a misplaced soul searching for an identity in a world that doesn't understand her, she just longs for something more than what she currently is. The fact that that something has been calling to her since she was a baby only makes her journey more emotionally resonant - as we watch her grow up on a screen in a beautifully animated montage, we see how often she has tried to approach this part of her life, only to be pulled away at the last moment every time. We understand how much she wants this, and it makes the payoff hit a million times harder. Watching Moana sail the seas and battle giant gods is thrilling, but it also registers on an emotional level due to the subtle character work the film has laid out in its opening act. Speaking of the three act structure, Moana's first act is where the film is strongest. The film's introduction is faultless - it lays out its own rules without feeling exposition-heavy, it introduces characters and defines them in a matter of seconds, and it perfectly pulls us into the tone and atmosphere that the rest of the film will follow. As we fly around the island of Motunui and learn Moana's culture, it's impossible not to take in how fully realised this world is. It's only when that world expands that the film loses its wonder. Our first encounter with Maui is fun, but his character beats feel too obvious when he traps her on his island and sails away without her. The film eventually redeems itself with some later insight as to who Maui is, and thankfully his story ends on a surprisingly poignant note. Elsewhere, a scene in which Moana and Maui fight a giant singing crab to regain Maui's magical hook feels seriously misguided. What once was magical soon felt silly, and the film loses a lot of focus and momentum by spending so much time here. The animation is dazzling - as it is throughout, ranging from Moana's free-flowing hair to the gorgeous colours of the ocean at both day and night - but the scene can't help but help disconnected from everything that comes both before and after it. Luckily, Moana makes a comeback in the homestretch, where it pulls off a number of character resolutions and plot twists with ease, ending on a thematically powerful note that really works. The animation is consistently beautiful, it's suitably funny and the music works nicely ("How Far I'll Go" will not leave your head for days), but where Moana truly excels is in the astonishing characterisation of its lead. Moana is the heart and soul of this film, and the depth of her desire to achieve her goals is so frequently displayed in so many ways that she almost instantly soars to the very upper echelon of all Disney characters. Her motivation to achieve all of this comes mostly from a longing to help her people, but even that can be traced back further to the wonderfully simple moment of her finding a shell on the beach. The fact that Moana also completely abandons any romantic subplot is also noteworthy in that it really allows Moana to feel just as independent as she is determined to learn and grow. She is a lovable character that you root for from the very first minute, and the way the film breaks away from convention to allow her story and definition to flourish is what sets this apart from most other Disney animations. Moana may be a tad too uneven to match the studio's recent highs of Tangled and Zootropolis, but it's a damn sight better than Frozen, that's for sure. To Summarise: The film's breathtaking animation, enjoyable music and formula-defying nature set up a solid Disney animation, but Moana finds greatness in the depth and magic of its wonderfully multi-dimensional titular character.